Most of us remember the stand-off between ranchers and the federal government in Oregon in 2016. Robert LaVoy Finicum was killed during the protests surrounding these events. Yesterday The Wall Street Journal posted an article about W. Joseph Astarita, who was part of the FBI’s Hostage Rescue Team deployed out of Quantico, Va., to assist other state and federal law-enforcement officers during the standoff. Mr. Astarita is now on trial in U.S. District Court in Portland, Ore., on charges of making false statements and obstruction of justice related to the 2016 fatal shooting of Robert LaVoy Finicum. The trial will bring to a head the tensions between Western ranchers and the government that had been at the heart of the 2016 standoffs. Mr. Bundy’s armed occupation was fueled by the federal prosecution of Oregon rancher Dwight Hammond and his son, Steven, for arson. The duo, who were sentenced to five years in prison, received a presidential pardon earlier this month. Mr. Bundy was acquitted for his role in the occupation, along with six followers. The death of Mr. Finicum has spurred outrage among friends and family. They have long accused the government of carrying out a deadly vendetta. While federal investigators determined the rancher was reaching in his coat for a gun when he was shot, supporters said he was surrendering. “Someone needs to be charged with murder,” said Angie Bundy, wife of Mr. Bundy’s brother, Ryan. The original disagreement between the Bundy family and the federal government had to do with federal regulation of grazing lands. 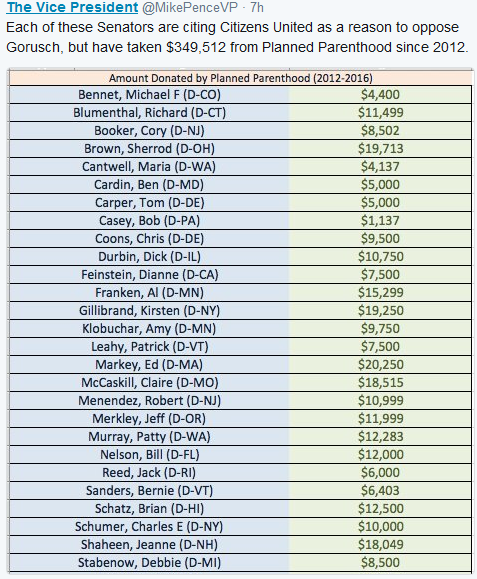 Planned Parenthood is an organization that takes money from the federal government. They are also an organization that lobbies the federal government. They are also an organization that makes political contributions. How do we know that our taxpayer dollars that go to Planned Parenthood don’t wind up in the pockets of lobbyists or politicians? I don’t think we do. Obviously, either way there is a problem. Where am I going with this? The Environmental Protection Agency (EPA) has just declared war on most of the cars in America. On Tuesday, Investor’s Business Daily posted an editorial about the latest move by the EPA. The EPA’s proposal to increase the amount of ethanol that must be blended into gasoline is a trifecta of regulatory abuse. It will do nothing for the environment, it will do nothing for energy security, and it could wreck millions of car engines. …The EPA’s proposal would require refineries to blend in almost 19 billion gallons of ethanol and other “biofuels” by 2017, which is 700,000 gallons more than they do now. But there’s a problem. Americans aren’t consuming enough gasoline. In fact, consumption this year is well below the 2007 forecast, both because cars are more efficient and because people are driving less than expected. So, if oil refiners are to pump 19 billion gallons of ethanol into their gasoline supplies, they won’t be able to keep ethanol ratio below 10%. Why does that matter? Because ethanol is corrosive and can degrade plastic, rubber and metal parts. And the more ethanol in gasoline, the most likely this damage will occur. So going above 10% can wreak havoc with car engines — as well as those in motorcycles, lawnmowers, power boats, you name it — that aren’t built to handle the higher ethanol levels. The first thing to consider here is that the EPA is not legally entitled to make laws–only Congress can do that. The EPA is not elected and is therefore not accountable to the voters–therefore they do not have the right to enact laws. The article also points out that increased use of ethanol drives up food prices, which actually hurts the poor. So why in the world isn’t Congress fighting back? If you were running for office in a farm state, would you want to tell the farmers in that state that the price of corn will be going down because ethanol has not been the wonderful thing you thought it was? So why is the EPA pushing ethanol? Does it help fight global warming? Does it help cities fight smog? Does it help the U.S. become more energy independent? A 2011 study by the National Research Council found that ethanol use could boost overall CO2 emissions. An earlier study published in Science also found that, when you consider the impact of converting forests and grasslands to cornfields, ethanol sharply increases carbon emissions. Meanwhile, a 2007 study by a Stanford University environmental engineer found that increasing ethanol levels in gasoline can lead to more smog. The idea that we need ethanol to become energy independent might have made sense in 2007. But the fracking boom since then has unleashed massive new domestic supplies of oil and natural gas, rendering this argument entirely moot. Here’s an idea. Rather than requiring oil refiners to pump more of this dirty and expensive fuel into gasoline supplies, the federal government should abandon the ethanol requirement altogether. Big Corn might not like it, but millions of car owners will be grateful. When the government gets involved in what should be the free market, bad things happen.